Wing Chun's second form chum kiu builds on the base of knowledge learned in the first form and teaches the practitioner how to use these skills under different conditions. The first section of Chum Kiu teaches how to use turning and techniques at the same time, for example the Bong Sau and Wu Sau with turning and body shifting. This is teaching the practitioner to use the hips to develop power, something which is not seen in the first form. It is also teaching the practitioner about body positioning when using techniques like the Bong Sau which becomes considerably more effective when combined with body shifting (turning). The first section also introduces two way energy as seen when the Lan Sau arm Laps and a straight punch is delivered. This enables the practitioner to deliver more devastating blows with relative ease as the Laping arm is enabling the transfer of power across the body as the force can flow in one motion without interruption, with the addition of pulling your opponent off balance, the target will also be moving into the punch and so additional damage will be caused. The second section introduces Wing Chun stepping, this, when combined with techniques enables the safe bridging of the gap between the practitioner and his/her opponent. Hence Chum Kiu or ‘seeking the Bridge'. 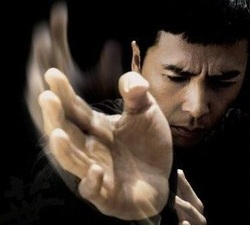 For it is with contact that Wing Chun practitioner has his/her biggest advantage. Furthermore the second section of Chum Kiu is building on Siu Lim Tao by making the practitioner use both footwork and kicks with hand techniques such as blocks. Chum Kiu also introduces the Wing Chun practitioner to three different kicks, a lifting kick to block others kicks, a front kick which can be aggressive or defensive but never flashy, and a turning kick which again can be used to stop the advance of an attacker or strike them. The Wing Chun kicks like hand techniques are non committal and do not compromise the balance of the practitioner in any significant way, due to their exceptional speed but lack of height. Also throughout the practice of Chum Kiu the practitioner must use both hands at once. Although this is done in Siu Lim Tao, when both hands are used in the first form they perform the same action whereas in Chum Kiu they do different things, requiring a higher level of ability and concentration form the practitioner. Therefore Chum Kiu builds on Siu Lim Tao.